In the last three months, Cardano (ADA) has risen significantly. It is one of the best performing cryptocurrencies. However, such impulses have happened in Cardano (ADA) in the past as well. That is why investors are trying to figure out whether it is any different this time around or whether the impulse will also die down. We look at some of the data points revolving around Cardano (ADA) rally to understand more. Cardano Rally: Is it different this time? Three months ago, Cardano (ADA) was trading around $ 0.0371. The market cap was around $ 961.97 million. When you look at the trading price of Cardano today, it is trading around $ 0.0662. The market cap is about $ 1.7 billion. It indicates that it has risen by 78% in a matter of just three months. The cryptocurrency markets itself have remained positive in these three months. However, Cardano (ADA) has outperformed most of these cryptocurrencies. When you look at it holistically, you will realize that the performance, however, has not been that stellar. A year ago, it was trading around $ 0.16. That is why, on a year-on-year basis, it has fallen by approximately 63%. It indicates that while in the shorter term, it might have rallied but in the longer term, it has lost value. In the past three months, the volumes have risen as well. The volumes rose from around $ 22 million-$ 100 million. It indicates that Cardano (ADA) has risen on heavy volumes. Due to this really, Cardano (ADA) is now among the top 10 cryptocurrencies. It had lost that spot earlier to Tron (TRX). It has overtaken Tron (TRX) once again to reach the 10th spot. 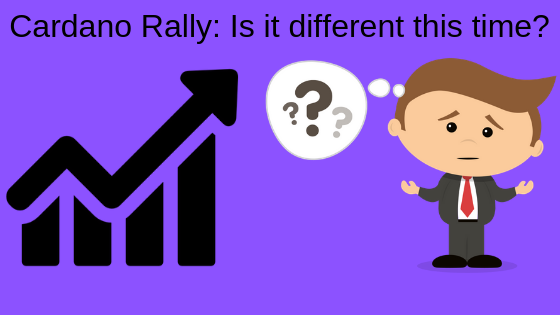 The question which arises is whether the rally will hold out this time or not. Is it different this time around? We will try to answer that below. One of the main reasons why it can be different this time around is that it is backed by volumes. Moreover, since it has fallen significantly in the past year, it has plenty of headroom to rise as well. On the other hand, in the rally of the past three months, it has cleared multiple resistances. Due to this very reason, the momentum is on the rise. Moreover, since it has defied the general trend of the cryptocurrency market, and is insulated from the cryptocurrency market. It had outperformed even when the dominant cryptocurrencies like Bitcoin (BTC) were more or less stagnant. While all of these signs might be positive but the relentless rally also increases the risk. That is why it might be able to defend its gains to a large extent, but that does not mean that it is worth investing at this point. So, the rally in Cardano (ADA) seems different this time around, but it does not create any buying opportunity for the new investors.